1.1 These conditions apply to all our deliveries of goods and the provision of services by Wolf Racing Neuenstein GmbH & Co. KG (hereinafter referred to as WRN) due to orders through our online shop at the Internet address www.wolf-racing.de or due telephone. Offers on the Internet apply exclusively to orders placed via the Internet. 1.3 These terms and conditions apply exclusively. We shall not accept different Terms & Conditions of the Customer unless they have been confirmed by us in writing. 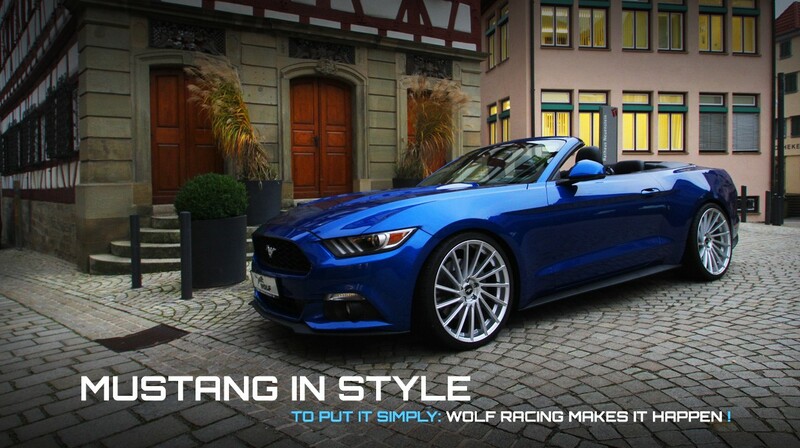 2.1 The offers in our online shop www.wolf-racing.de do not constitute an offer to conclude a contract, but merely an invitation to such an offer. With his order, the customer makes a binding offer to conclude a contract. WRN can accept this offer either by an order confirmation by e-mail or by delivery of the ordered goods. The contract comes into effect on the earlier of the two dates. Before this, the customer receives an automated confirmation of his order from WRN by e-mail to the e-mail address provided by the customer during the order process. A contract is not yet concluded as a result of this confirmation. We merely fulfil our legal obligations to provide information. The contract is only concluded upon receipt of an order confirmation by e-mail or delivery of the ordered goods. For the acceptance of the contract we reserve a period of two working days from the customer`s order. In the first step, the customer selects the desired goods by placing them in the shopping basket. In the second step, the customer enters his data including invoice address and, if applicable, a different delivery address and selects the type of payment. In doing so, he also accepts the General Terms and Conditions which are the subject matter of the contract. In the third step, the customer has the possibility to check the correctness of his data and to correct input errors if necessary. In the fourth step, the customer can send his order to the WRN by clicking on the button "Order for a fee" and thereby submit a binding offer in accordance with 2.1. 2.3 In the case of ordering by phone, the contract is only concluded upon receipt of an order confirmation by e-mail or delivery of the ordered goods. The contract comes into effect on the earlier of the two dates. For the acceptance we reserve a period of two working days from the order of the customer. 2.4 If the customer chooses the article "Performance increase", a contract for work and labour is concluded. 2.5 The contract language is German. 2.6 The transfer of rights and obligations of the customer from the contract require the written consent of WRN. 3.1 The prices quoted by us are gross prices including the applicable statutory value-added tax (VAT). 3.2 For each delivery of goods there are additional shipping costs. For deliveries of goods within the Federal Republic of Germany these amount to 7.00 Euro. Shipping costs abroad depend on destination country, size and weight. 4.2 If the customer chooses prepayment by bank, the WRN will inform his bank details in the order confirmation. 4.4 Electronic payments must be made to the bank account which is notified to the customer for this purpose. 4.5 The customer must transfer the invoice amount to the account of WRN within 14 working days. 4.6 The work wage is to be paid after acceptance. 4.7 The customer can only offset claims of WRN if the counterclaim of the customer is undisputed or legally binding. He can only assert a right of retention if it is based on claims from the purchase contract. 5.1 The delivery of the ordered goods and services takes place by post office and/or parcel shipping. 5.2 WRN is entitled to make partial deliveries insofar as these are reasonable for the customer and without additional delivery costs being charged to the customer. 5.3 WRN has the right to combine several ordered articles in one delivery. 5.4 Unless otherwise stated in the item description, WRN will dispatch the ordered goods within two working days after receipt of payment. In the case of delivery on account, WRN will dipatch the ordered goods within two working days after the customer has received the order confirmation by e-mail. 5.5 The customer is requested to complain to the deliverer about delivered goods with obvious transport damage and to inform the WRN about this. If the customer does not comply, this has no effect on his statutory or contractual claims for defects. 6.1 Subject to sentence 2, the WRN is obliged to comply with a completion date designated in writing as binding. If the scope of work changes or expands compared to the original order and if a delay occurs as a result, WRN must immediately specify a new completion date stating the reasons. 7.1 Unless otherwise agreed, acceptance by the customer shall take place at WRNs premises. 7.3 The customer is obliged to accept the object of purchase within one week from receipt of the notification of availability. In case of no acceptance by the customer the WRN may exercise ist statuatory rights. 7.5 In the event of default of acceptance by the customer, WRN is entitled to damages. 8.1 The object of purchase remains the property of WRN until the full payment of the delivered goods and all other goods of the same order. Until complete fulfilment, the customer must treat the goods with care and ensure that third parties who are granted access to the goods also handle the goods with care. 8.2 If the customer is a legal entity of public law, a special fund of public law or an entrepreneur who acts in the exercise of his commercial or independent professional activity when concluding the contract, the retention of title shall also apply to WRN`s claims against the customer from the current business relationship until settlement of claims existing in connection with the purchase or the order. 8.4 As long as the retention of title exists, the customer may neither dispose of the object of purchase nor grant third parties contractual use. In the event of defects, the statutory warranty regulations shall apply. 10.2 Essential contractual obligations are such obligations which protect the customers legal positions essential to the contract, which the contract has to grant him according to its content and purpose. Furthermore, such contractual obligations are essential, the fulfilment of which enables the proper execution of the contract in the first place and on whose compliance the customer regularly trusts and can rely. or (in the event of a contract of goods in partial shipment or items) on which you aquire, or a third party other than the carrier and indicated by you acquires, physical possession of the last part or item of the goods. 11.2 The right of revocation does not apply to contracts for the delivery of goods which are not prefabricated and for the manufacture of which an individual selection or determination by the customer is decisive or which are clearly tailored to the personal needs of the customer. Likewise, customers who are not consumers within the meaning of 1. 2 of these General Terms and Conditions have no right of revocation. (*)Please cross out what is not applicable. We collect, process and use the personal data of the customer(s) only in accordance with the relevant data protection regulations of the Federal Republic of Germany, in particular the Federal Data Protection Act (BDSG), the General data Protection Regulation (GDPR) and the Telemedia Act (TMG). Further explanations on the subject of data protection can be found on our website www.wolf-racing.de under the heading "Data protection" (Datenschutz). 13.1 The laws of the Federal Republic of Germany shall apply to all legal relationships between the parties. The application of the uniform laws on the international purchase of movable goods is excluded. In the case of a contract with consumers, this choice of law applies only insofar as the protection granted is not withdrawn by mandatory provisions of the law of the country in which the consumer has his habitual residence. 13.2 The exclusive place of jurisdiction for all current and future claims arising from the business relationship of the WRN with merchants, with legal persons under public law or with special funds under public law, including bills of exchange and cheque claims, is the registered office of WRN. 13.3 The same place of jurisdiction shall apply if the customer has no general place of jurisdiction in Germany, moves his domicile or usual place of residence outside Germany after conclusion of the contract or his domicile or usual place of residence is not known at the time the action is filed. Otherwise, in the case of claims of WRN against the purchaser, the purchasers place of residence shall be the place of jurisdiction. 13.4 For settling consumer disputes out-of-court, the European Union offers a platform for online dispute resolution (“ODR platform“) at https://ec.europa.eu/consumers/odr/. We are prepared to participate in an out-of-court conciliation procedure before a consumer conciliation body. The Allgemeine Verbraucherschlichtungsstelle des Zentrums für Schlichtung e.V., Straßburger Straße 8, 77694 Kehl am Rhein, www.verbraucher-schlichter.de, is responsible.